A slab-on-grade is a type of shallow foundation in which a concrete slab rests directly on the ground below it. 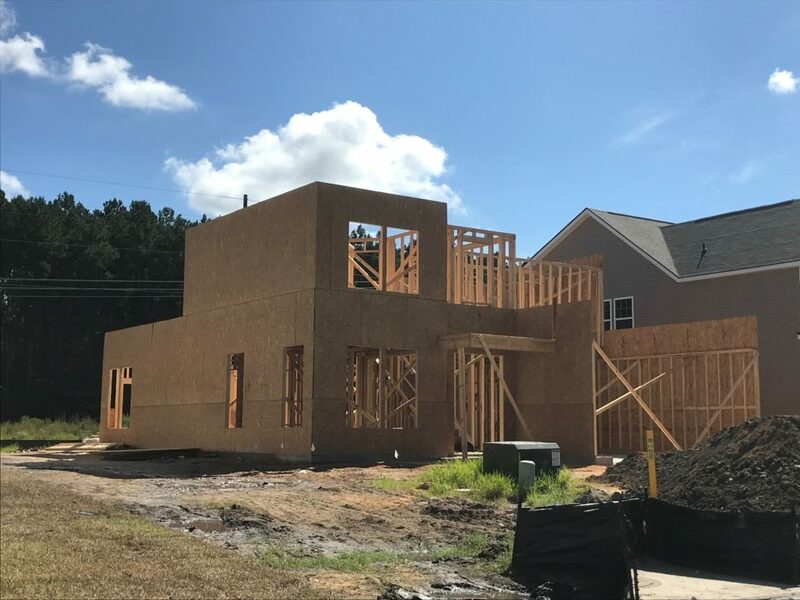 A slab-on-grade foundation usually consists of a thin layer of concrete across the entire area of the foundation with thickened footings at the edges or below load bearing walls in the middle of the building. 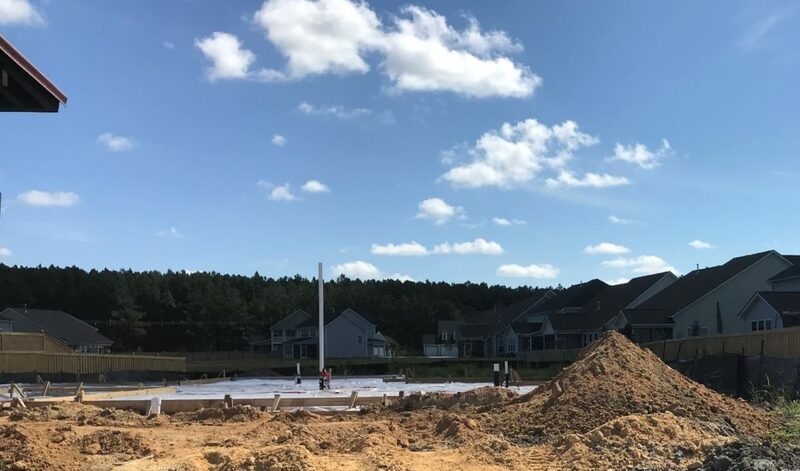 Slab-on-grade foundations can be compared to their most common counterpart for residential construction, a shallow foundation of footings supporting piers and the residence resting on the piers. A home resting on footings and piers is a home with a crawl space below the first floor. A home with a slab-on-grade foundation has no crawl space. The picture below shows a home under construction on a slab-on-grade foundation. At the bottom of the framed wall you can see a horizontal grey strip which is the slab-on-grade foundation resting directly on the soil below. The next photograph shows the wood form laid out for pouring a slab-on-grade foundation. The clear plastic material inside the form is a moisture barrier intended to keep moisture from migrating up from the soil through the slab. The white pipes sticking up are for the home’s plumbing and electrical. A slab-on-grade has an increased susceptibility to soil settlement if the slab is not poured to the proper depth. If the subcontractor pouring the slab, either from laziness, a desire to save money or oversight, does not dig the form for the slab out deep enough, then the slab may be too thin and susceptible to cracking and soil movement. Soil settlement damage to a slab-on-grade foundation is more difficult to repair. Because the slab rests directly on the soil below, jacks cannot be placed below the slab to lift and stabilize the foundation. Instead, soil settlement damage to slab-on-grade foundations is commonly repaired by boring holes through the foundation and installing piers through the foundation. Another potential repair is to pump a “slurry,” a mixture of water and cement, below the slab to lift the slab. However, the process of installing piers or using a liquid mixture to lift the slab both can themselves cause extensive damage to a home. Often, incorrectly installed slab-on-grade foundation will crack. Most often foundation will crack if the concrete is not cured properly. This problem is magnified when the slab is not poured to the proper depth or the concrete mix is wrong. Cracks in a home’s foundation can contribute to many structural problems and damage of the home. Because a slab-on-grade foundation rests directly on the soil below it, moisture and drainage problems can result as concrete is a porous material. If the slab and the soil below it are not properly separated by a barrier then, moisture can move up through the slab and into the living area of the home above. The typical signs of moisture and drainage problems include water stains and mold or mildew. If undetected, moisture can cause rot in the framing of the home. Slab-on-grade foundations cause homes to rest very low to the ground, making them susceptible to flooding. A home on a slab-on-grade foundation can flood if the surrounding yard and/or properties have not been graded properly. Other causes, like severe weather conditions, can also result in water rising above the top edge of the slab. Heat loss often occurs when the slab-on-grade foundation is not thick enough. The concrete slab resting on the soil below can cause significant heat loss from the living space above if the contractors did not dig out a deep enough form for the foundation. Such a construction defect can cause severe discomfort and financial losses to the homeowners. If you find a defect in your home’s slab-on-grade foundation, contact the construction defect lawyers at Steinberg Law Firm as soon as possible. If the defect is serious, then it needs to be inspected by an architect or engineer who is an expert in the field – not by an architect or engineer associated with the builder. The experienced construction defect attorneys at Steinberg Law Firm can assist you in figuring out if you have a claim worth pursuing.